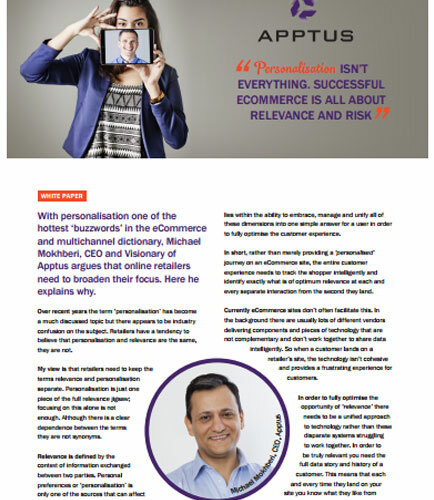 "Personalisation: Successful ecommerce is all about relevance and risk"
Personalisation is one of the hottest ‘buzzwords’ in the eCommerce and multichannel dictionary, argues that online retailers need to broaden their focus. Rather than solely providing a ‘personalised’ journey on an eCommerce site, the entire customer experience should track the shopper wisely and identify exactly what is of optimum relevance at each and every separate interaction from the second they land. This whitepaper helps the eCommerce sites to fully reach the potential of their online capabilities by harnessing the power of the intelligent technology. The future of retail is bigger than flashy new technologies or the hyper-connected Internet of Things. The retail paradigm has shifted from a single physical connection point with customers to a multi-pronged approach that crosses both physical and digital channels. This Exclusive Whitepaper presents a look at possible future retail formats and customer interface technology. It addresses key questions like: What is the significant impact on the retail industry when inventory and supply chain automation is being transitioned into the cloud? What are the trends that will shape the future of retail industry? What gives smaller retailers the ability to compete with larger retailers? What are the things organizations need to know about the future of retail? Read this whitepaper to gain unique insights into the future of retail. E-commerce is the process of buying and selling goods and services over the internet. Technologies such as mobile commerce, electronic funds transfer, supply chain management, internet marketing, online transaction processing, electronic data interchange (EDI), inventory management systems, and automated data collection systems are also a part of e-commerce.